Viral picture of ELDERLY WOMAN BURIED UP TO HER NECK - ayupp.com on August 3, 2018 (archive link). The image shared on the social media is not from Iran and also having wrong description given on the image. Images from stock photo website gives us the correct details of the picture, the image titled as ELDERLY COLOMBIAN WOMAN BURIED UP TO HER NECK DURING PROTEST, says Colombian Maria Gabriela Ruiz, 66, who is buried up to her neck in theground, is consoled by her grandchild during a protest in a popular sectorof Cali, July 4, 2003. Three people, two men and a woman, buried themselvesthree days ago in protest against the government because 150 displacedpersons have not been relocated to a safe sector of Cali. Pictures of theYear 2003. However it is a fact that stoning do happens in Iran, however above picture in circulation is giving wrong information. Brief Outline: Viral picture claims of a women being tortured to death by stone, however before death given a spoon full of water, is not from Iran. A woman just before being stoned to death in Iran under Shariah laws. 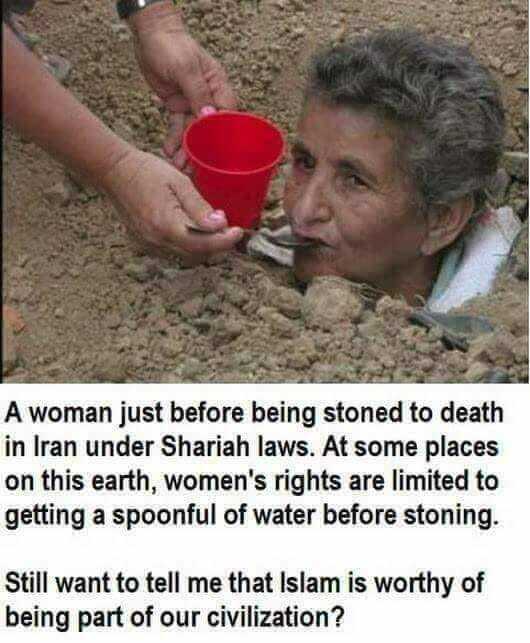 At some places on this Earth, women's rights are limited to getting a spoonful of water before stoning. Still want to tell me that Islam is worthy of being part of our civilisation? Facts Check Analysis: The picture was posted to /r/the_donald on Reddit on August 3, 2018 (archive link).